Mojo forever…if only…right? Some days the ol’ mojo is with you and some days not! LOL! Splitcoast Stampers TLC#411 The Best of 2012 – to use a favorite technique from the last year of challenges…had to go with distressed edges from the TLC#379, as it’s one of faves for sure! I started with a Very Vanilla card base in the standard 4.25″ X 5.5″. On top of that…a piece of designer paper that’s been distressed, inked and then stamped with the cute little heart flowers from Verve. Next comes a long rectangle in a coordinating designer paper, again, distressed and inked and this time…backed with one of my favorite dies from Verve…Pennant Trim. Another smaller long rectangle in yet another designer paper, distressed and inked followed by a Spellbinders Labels 22 die cut. It’s been topped with a punched circle that’s been distressed. I stamped several more of the images from the Verve No Matter What set in Cool Caribbean, then added the sentiment in Real Red over top. Some hand-dyed crinkled seam binding, some Turkey Red seam binding and a little brad for the bow. A little felt heart that’s been covered with Stickles and then finally, more Stickles on the little heart flowers in the lower right corner. You are quick, Lee-Anne!! Love the colour combo you used and the distressing. Great seam binding bow and way to flash the Verve 🙂 Well done all over! Have a fabulous week! 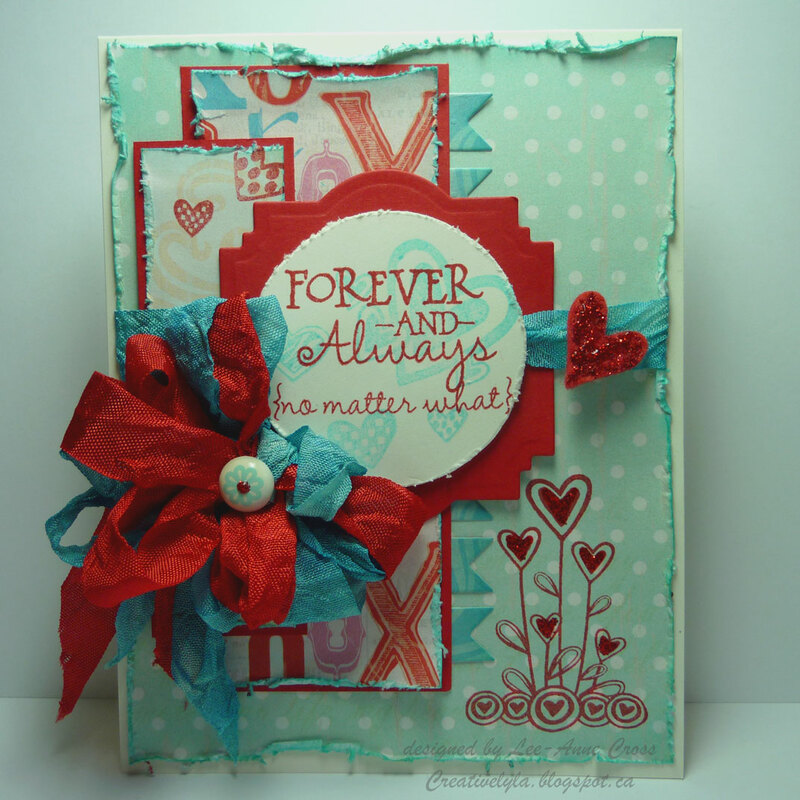 Such a lovely card, Lee Anne, love how you used the color combo! Thanks for sharing your card with us at the colourQ. A beautiful card. Thank you so much for sharing with us this week at the colourQ! I LOOVEEE Your colors on this adorable card! Super cute! Love your colors!! So pretty! Love the colors and that big beautiful ribbon treatment. Thanks for playing along with Mojo Monday! I love the colors! Very beautiful card! BEAUtiful. Great colours and I love the bows! great design and color choices – beautiful card!